The "Two-Can" water rocket was constructed in the winter and spring of 1998. * IMPORTANT WARNING * DO NOT TRY THIS AT HOME! 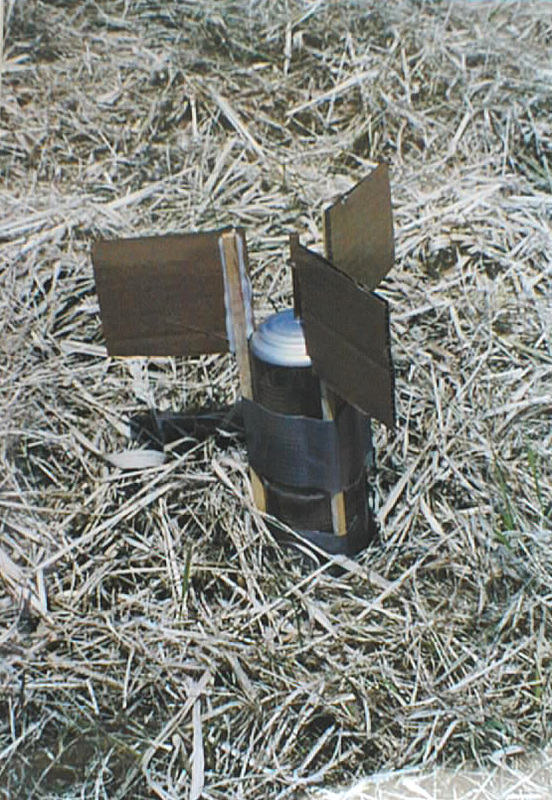 There are many potentially hazardous aspects to high-pressure rocketry using metal motors. 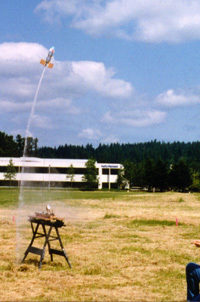 Water rocketry of this kind attempted without careful study, planning, and the proper precautions could injure or possibly kill you. Do not take any chances. YOU are responsible for your own safety. 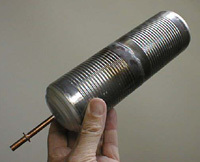 The rocket motor made from 2 deep-drawn steel soup cans. Empty it weighs less than 3 oz. 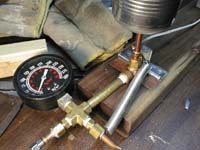 The nozzle is formed by 1/4 inch copper tube that has an inside diameter of about 0.185 inches. At 300 psi operating pressure this results in an initial thrust of over 10 lbs! 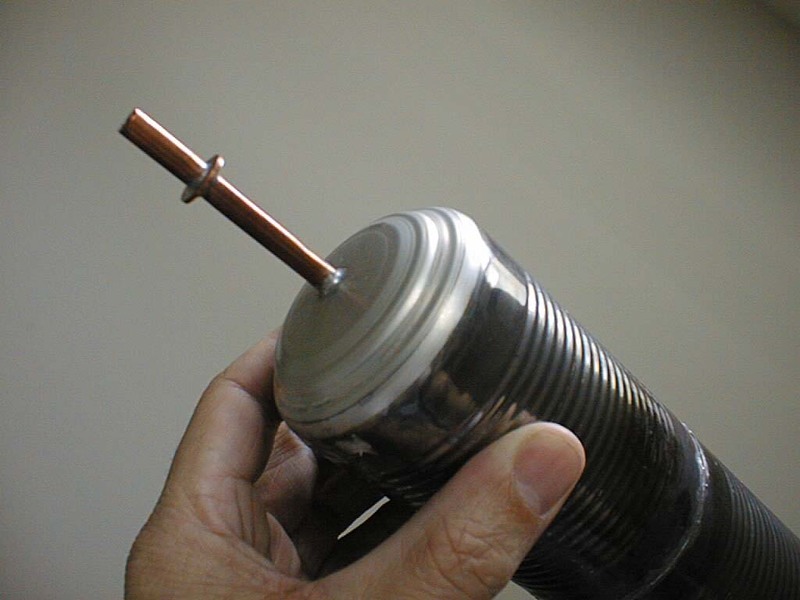 The copper washer soldered to the tube provides the mechanism to restrain the rocket during fueling, and then to release it. A T-hinge forms a sear with the nozzle washer which is released by a lanyard. 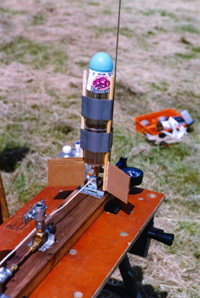 About 25 ft of nylon cord provides distance between the operator and the rocket at launch. Add a yogurt cup & plastic Easter egg for a nose cone, cardboard fins (This is recycling! 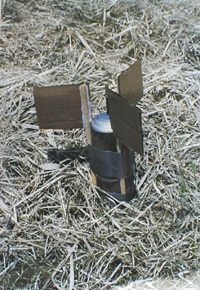 ), and it's ready for launch. Note the arching trajectory. 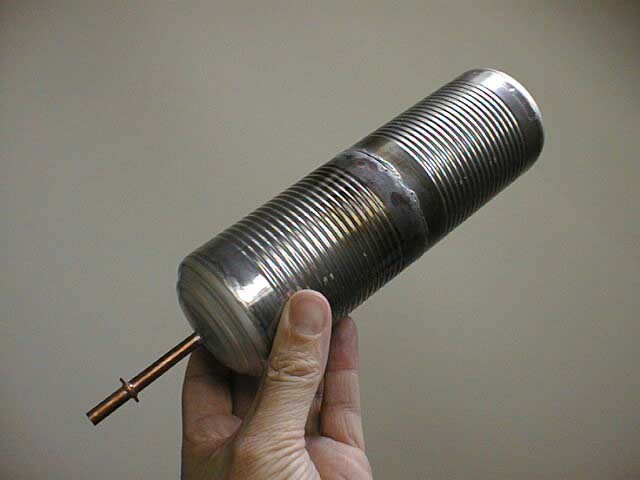 It appears that the 3 ft - 1/8 inch stainless weld rod used for a launch rod is inadequate for a rocket of this size. This rocket went over 400 ft.
Close to what the simulation predicted. What goes up must come down! Even after crushing the nose cone this rocket flew three more times!